Israeli cabinet approves deal to release Gilad Shalit in exchange for terrorists: 26 ministers vote in favor, three oppose. 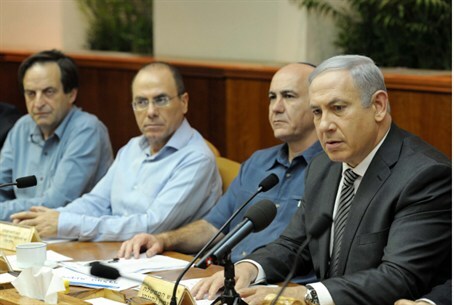 The Israeli cabinet voted late Tuesday night on the deal to release kidnapped Israeli soldier Gilad Shalit. The vote came following a stormy meeting. 26 ministers supported the deal with only three – Foreign Minister Avigdor Lieberman, Infrastructures Minister Uzi Landau, and Strategic Affairs Minister Moshe Ya’alon – voting against the deal. As part of the deal, Israel will release hundreds of terrorist murderers in the coming days. Hamas has reportedly agreed not to release some arch-terrorists, including Marwan Barghouti; Abdullah Barghouti, serving 67 life sentences; Hassan Salameh, serving 38 life sentences; and Jamal Abu Al-Hijja, serving nine life sentences, all of whom are imprisoned for planning suicide bombings. Also reportedly not included in the deal is the killer of Israeli minister Rechavam Ze'evi, Ahmed Saadat. Out of 450 prisoners that Israel agreed to release, 96 prisoners will return to their homes in Judea and Samaria and 14 will return to east Jerusalem. As well, 131 prisoners from Gaza will return to their homes, and six adult Israeli Arab prisoners will also return to their homes. Out of 203 terrorists from Judea and Samaria, 40 terrorists will be taken to countries overseas and the others will be deported to Gaza.